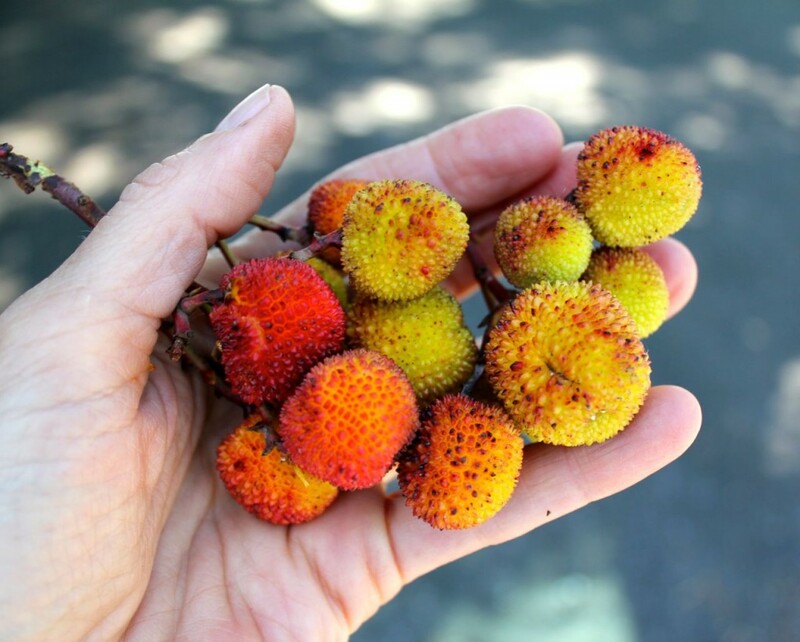 I would imagine, my Gentle Reader, that the last time you bought a carton of kiwifruit at the grocery store, you looked down at the fuzzy brown fruits and wondered about the story behind them. You’re a curious sort, otherwise why would you be reading this blog? Guess what: I am here today to satisfy your curiosity. 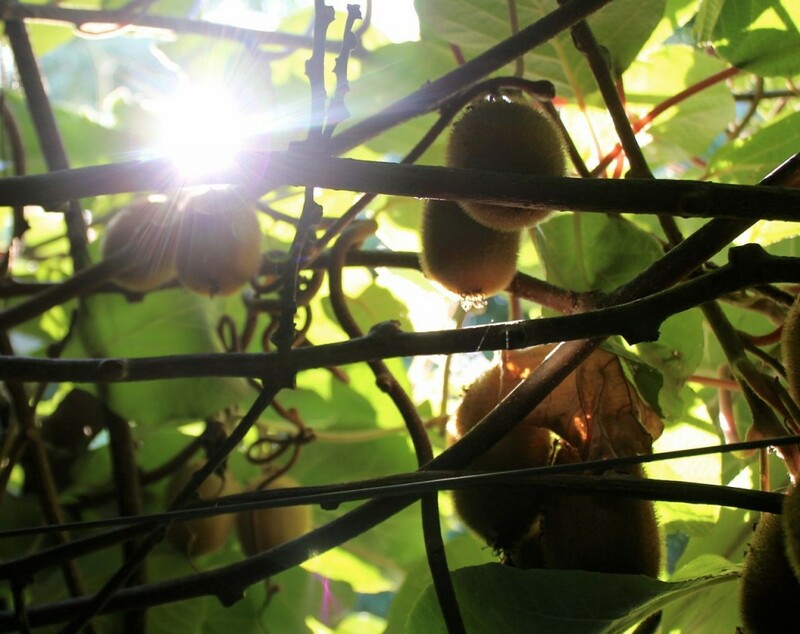 The story of the kiwifruit is an interesting one, especially if you enjoy learning about growing things, like I do. 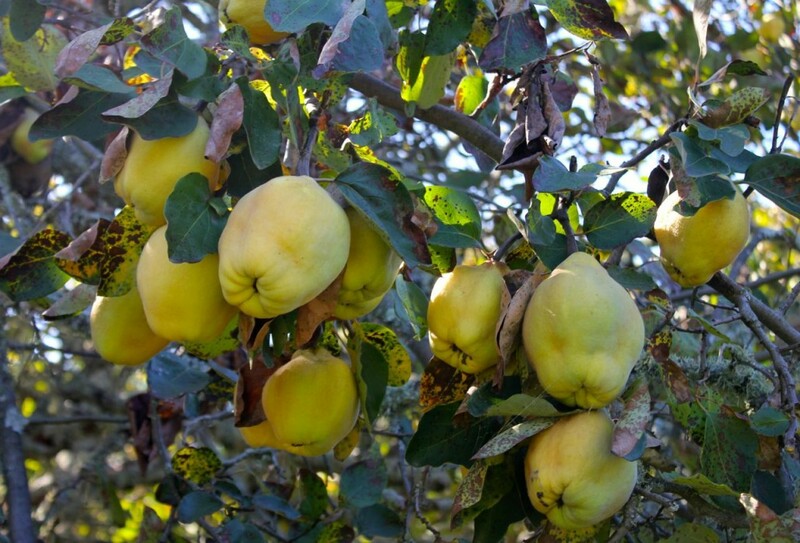 The surprising thing is this: it has only been a few decades since these delicious fruit have been available to buy nearly all over the world: not like, say, wild plums or apples or grapes, which have been available for the picking and for the buying, for as long as anybody can remember. At the end of our lesson, sweeties, we’ll hand out samples of New Zealand-grown kiwifruit and delicious kiwifruit wine and some sweet kiwifruit jam . . . oh, I guess we can’t do that, can we? But it would be fun if we could. Next time, we’ll meet on site! 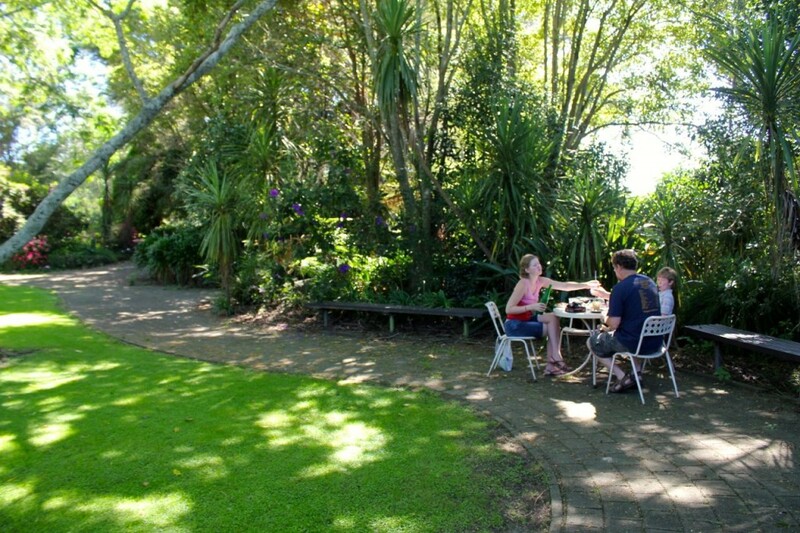 New Zealand is unabashedly impressive in many ways, but especially exciting to me (as a crazygardenlady gardener and a grower of many things) is how easily and beautifully things grow there. 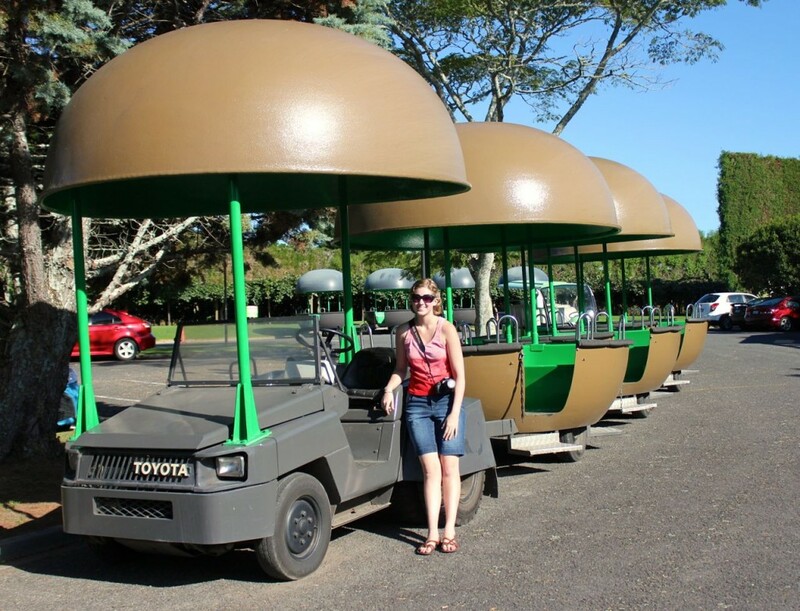 I wanted to visit growers while we were on our trip, and we settled on touring a kiwifruit orchard. The Bay of Plenty, the area of the north island where we stayed, has incredibly fertile soil and the highest number of hours of sunshine in New Zealand (according to our tour guide at the orchard). Also, they receive a goodly amount of rainfall year ’round: 60″ is the average annual amount of rainfall (that’s fully twice as much as we get here in our area of Nebraska, on a good year). 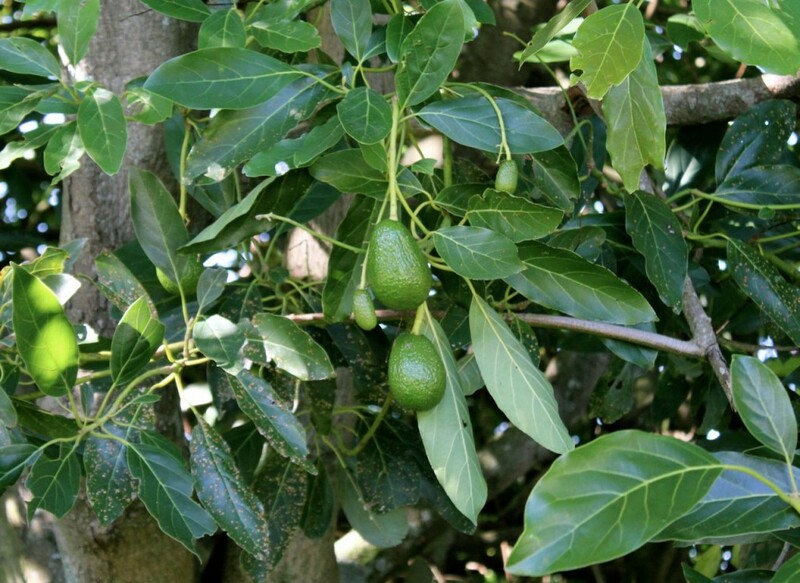 This lovely climate seems to be the perfect environment for growing many crops, including kiwifruit. Kiwifruit, actually, are native to China. Cultivation of the fuzzy fruit spread from there in the early 20th century to New Zealand, where the first commercial plantings occurred. Cultivars were originally called a variety of Chinese names, such as “yang tao” but the name “Chinese gooseberry” became common among growers in England and New Zealand during the early 20th Century. American servicemen, also, stationed in New Zealand during World War II became interested in the fruit and it was exported to California using the names “Chinese gooseberry” and “melonette”. 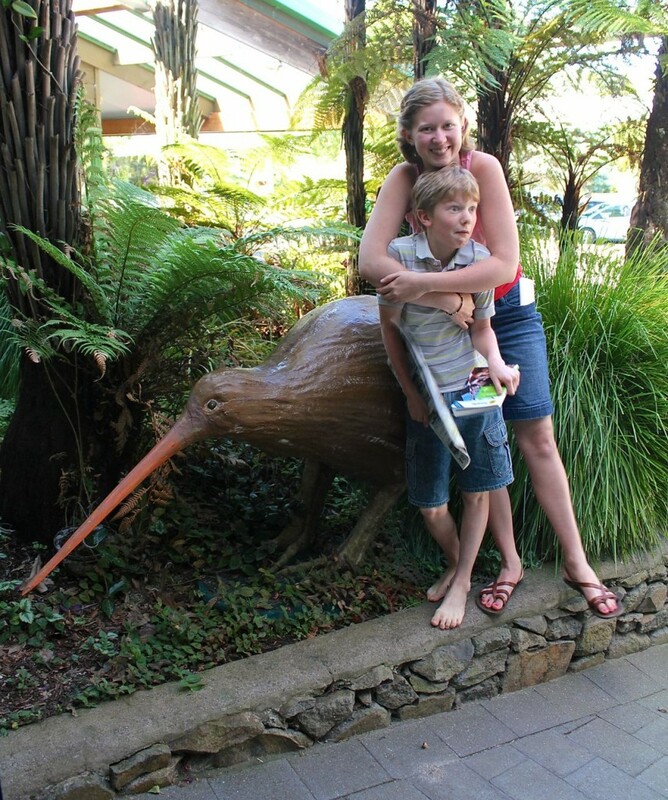 You can read much more about kiwifruit, if you wanna, right here. 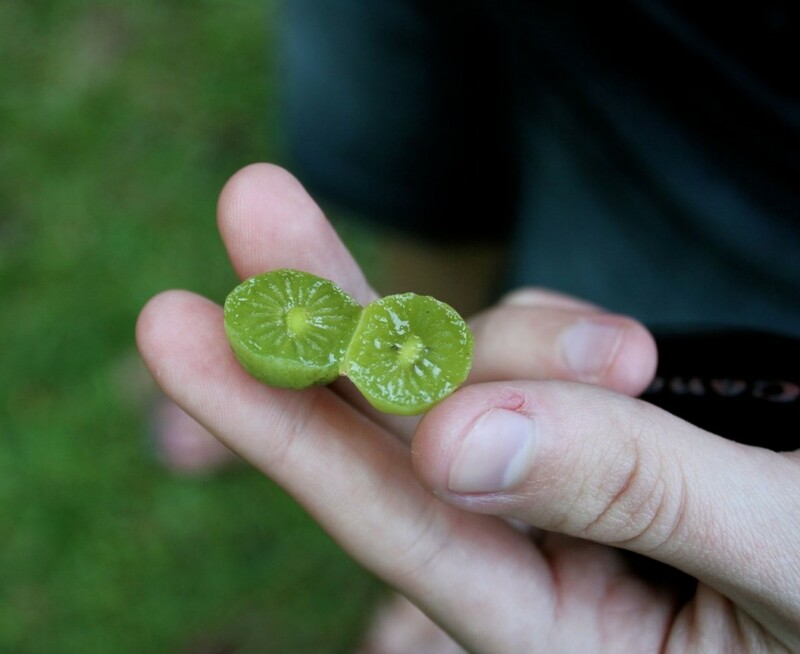 This is one variety of lesser-known kiwifruits,called kiwifruit berries, that is currently being grown and developed in New Zealand. In 1962, New Zealand growers began calling this confusing-looking fruit “kiwifruit” to give it more market appeal, and a California-based importer subsequently used that name when introducing the fruit to the American market. Americans started calling the fruits “kiwis” but this is not a correct term. If you get these terms confused in New Zealand, for example, “I ate three kiwis for lunch,” you will be sternly and promptly corrected. Just an FYI. Because I love ya. Okay, I just realized that I’m having too much fun with my words in this post, and that if I don’t stop, I’ll never get to the rest of the pictures. And the pictures are the best part, of course! Soooo, here we go . . . I shall attempt to hie myself off to the pictures . . . Pity these things aren’t tastier. The Irish Strawberry trees were absolutely loaded: can you believe how pretty they are? 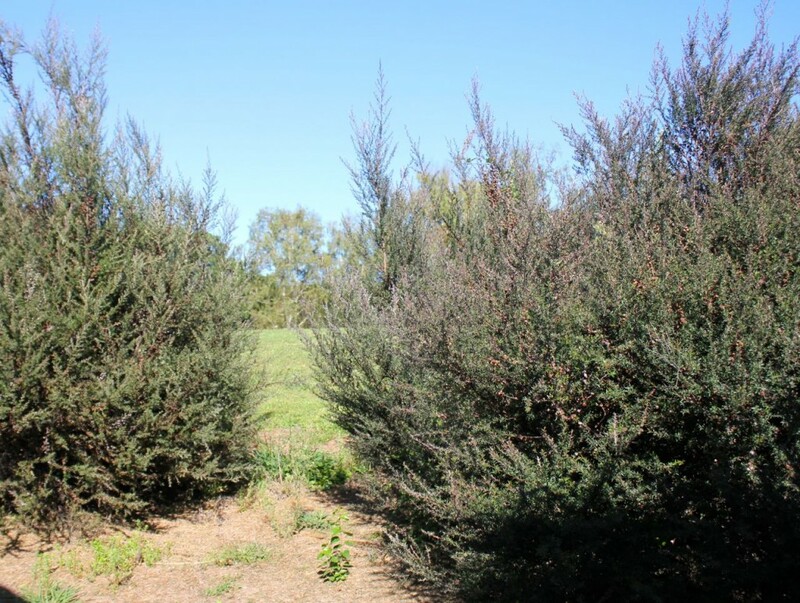 Manuka bushes: honeybees in New Zealand take nectar from these bushes to make the much-ballyhooed Manuka honey, which is so valued for its medicinal qualities. Our guide told us that all of these crops grew well, but the kiwifruit outperformed them all. 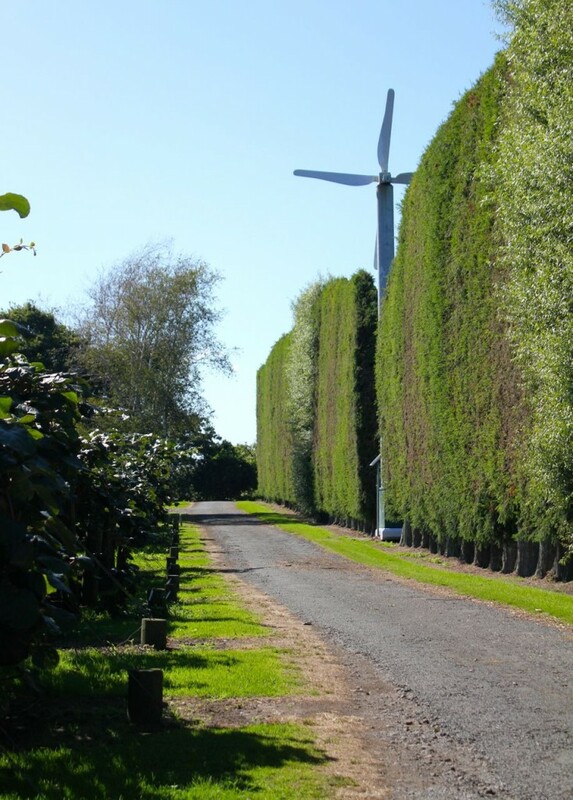 These tall hedges are grown and trimmed in a tidy way, to keep the wind from blowing the kiwifruit vines. At the end of the lane you see the stack of crates: they are what the kiwifruit are shipped in. There are stacks of them as far as the eye can see. The huge fan you see on the right is used to keep frost away from the vines, on the few occasions when the temperatures hover around freezing. It’s called a “frost tower,” by the by. 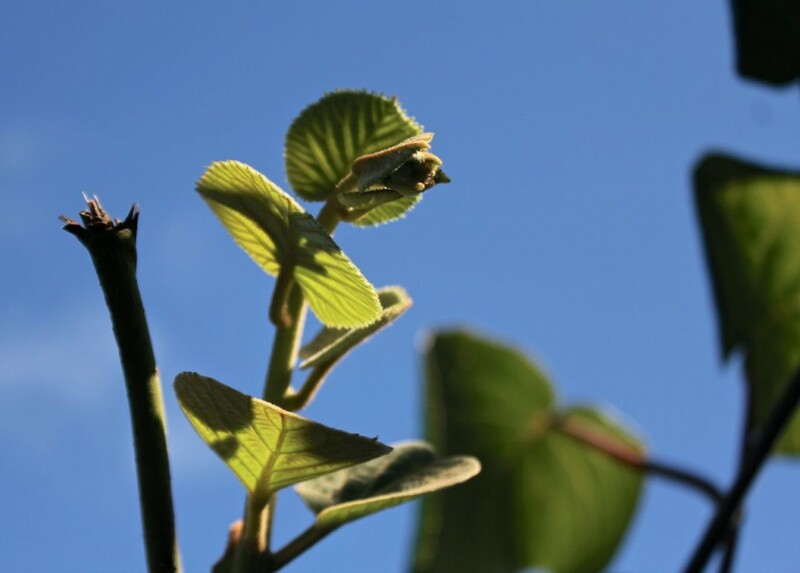 At the end of this sprig are the buds which will develop into next year’s kiwifruits. Look closely. See them? Here’s the trunk of a male kiwifruit vine. One male is grown for every four or five females. What do you think of those shadows? I looooove them. 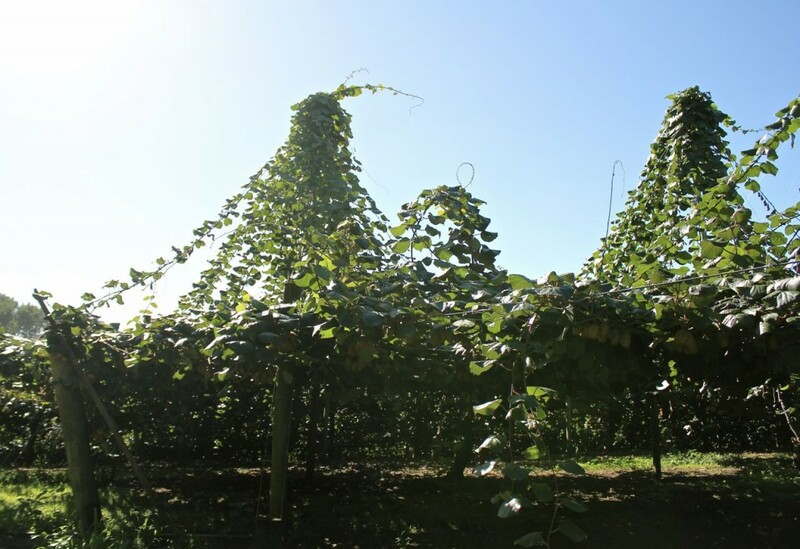 This is how the kiwifruit vines are grown: the fruit hang down in such a way that picking them when they are ripe is easy to do. Especially if you’re, say, a midget or at least not too tall. Dreamy place to work, in my opinion, but not if you’re above 6′ tall. 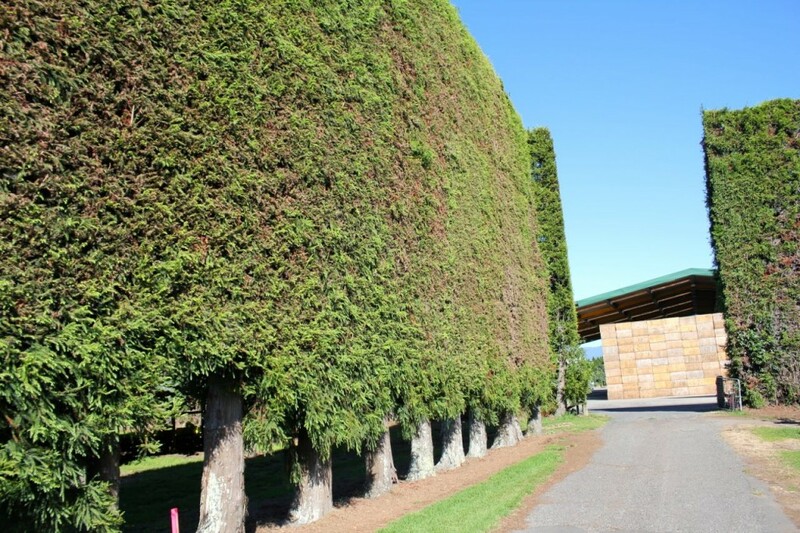 Here is the tall hedge against the wind on the left, and the kiwifruit vines to the right. These lines were strung up to make pruning easier: the new growth works its way up the strings, and then after the old growth (below) is pruned every fall, the lines are cut, allowing the new growth (where the kiwifruits will grow) settle down on the supports below. 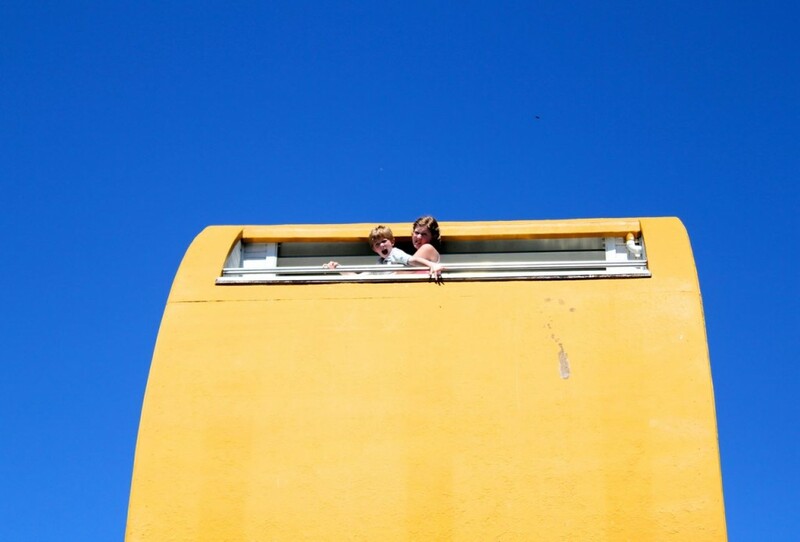 A lovely spot for a snack, eh? 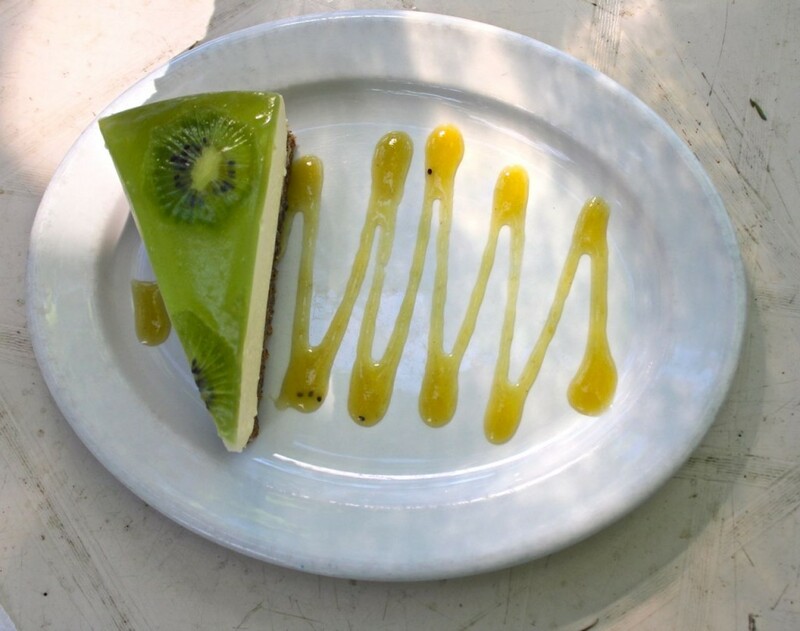 We had “flat white” coffees, and kiwifruit cheesecake. Good, good, good. 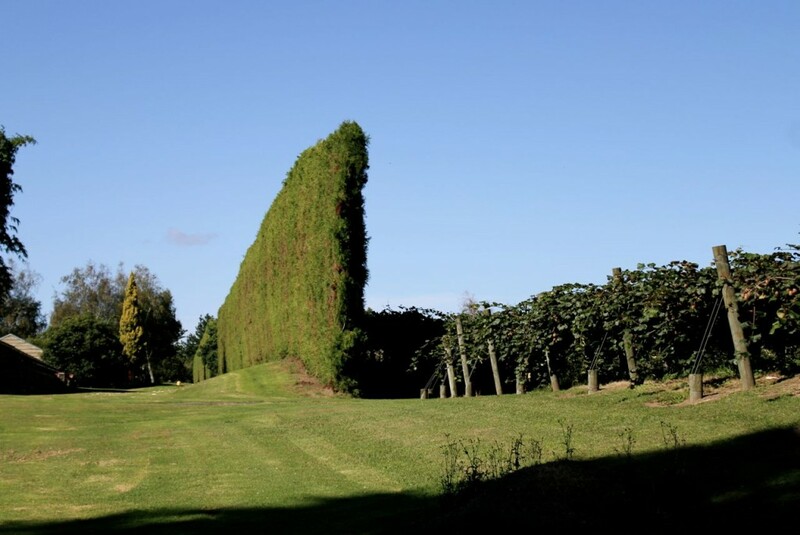 Yeah, this kiwifruit orchard was easy to find—“just turn at the huge kiwifruit slice—” See the little window cut-out at the far upper right of the structure? Here’s the view from the top! 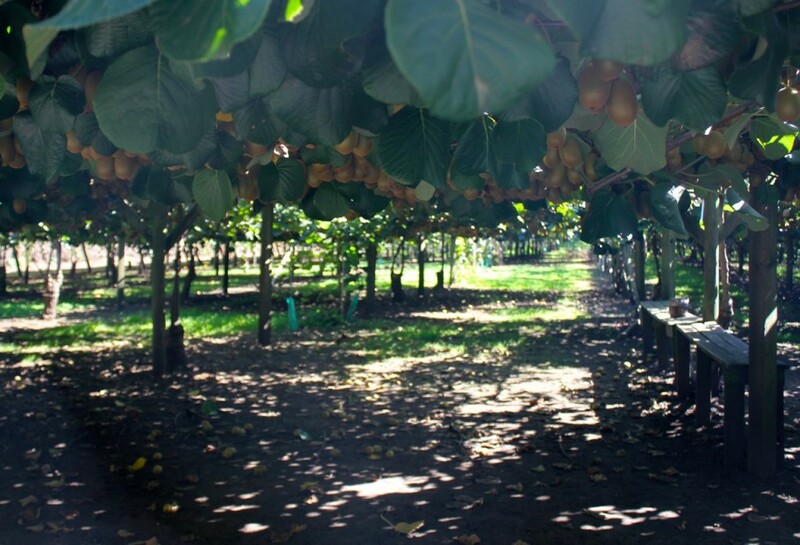 There are 2500 kiwifruit orchards in New Zealand. 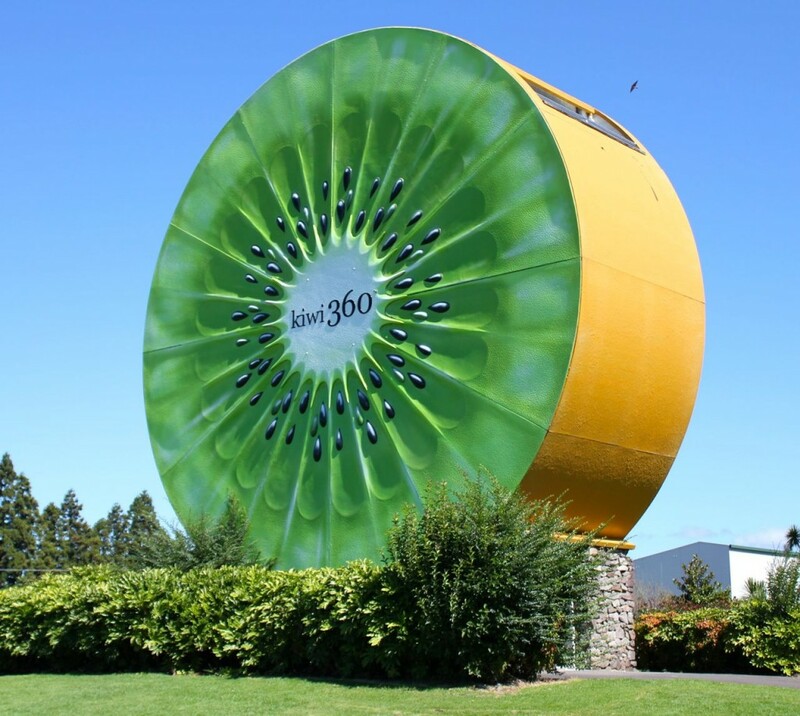 175 tons of kiwifruit are grown in New Zealand each year. 1.5 billion (give or take) fruit are picked every fall. 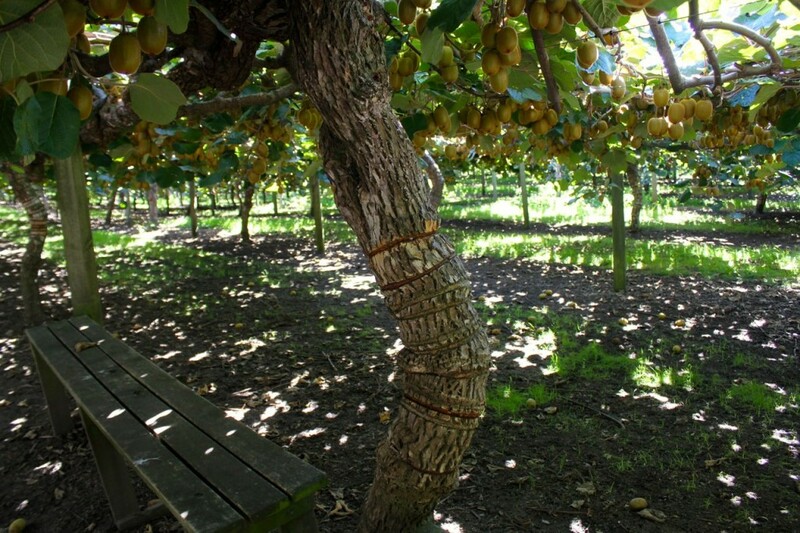 All kiwifruit are picked at once, though the harvest takes several weeks. 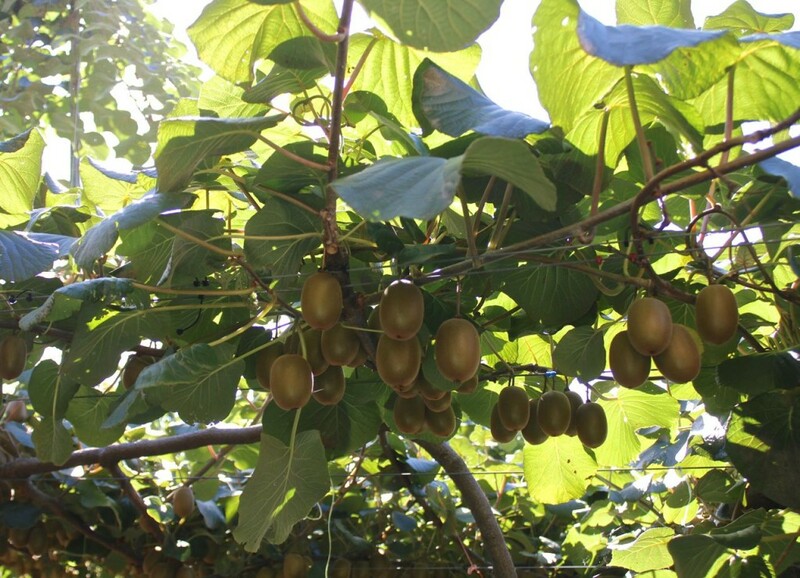 The New Zealand government issues 15,000 temporary work visas for kiwifruit harvest. 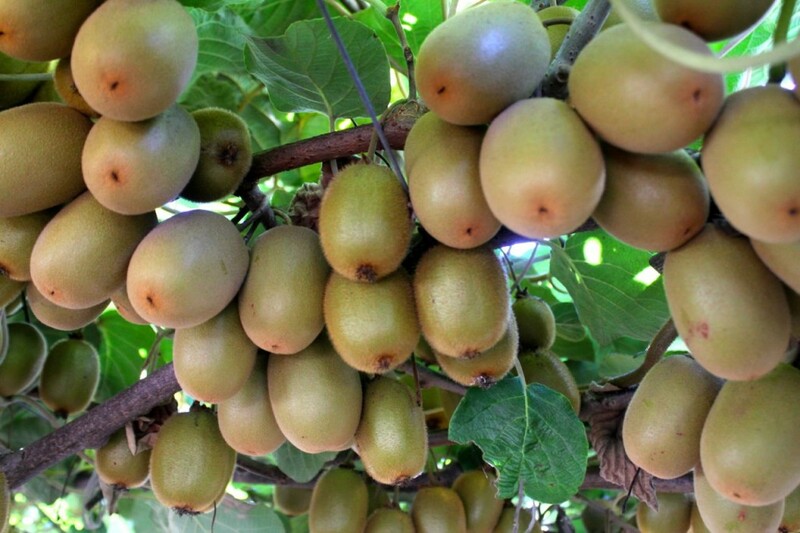 The kiwifruits are cooled for 8 to 10 months at right above freezing temps. When the New Zealand kiwifruits are exhausted, then those of us in one of those fortunate 60 countries have to put up with kiwifruits from Mexico, California, and Italy. 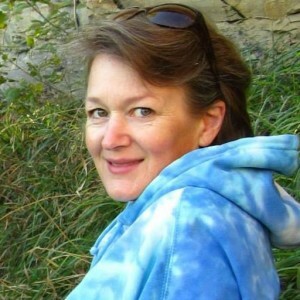 Thanks for reading, by the way–I appreciate you! 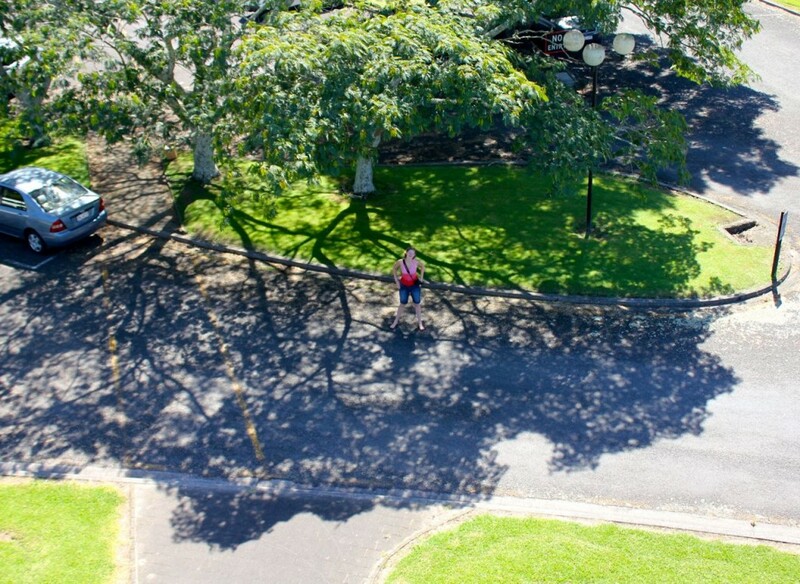 Tagged on: how kiwifruit are grown, James Viech developing kiwifruit, kiwifruit history, where are kiwifruit grown, where do they grow kiwifruit? Wow! 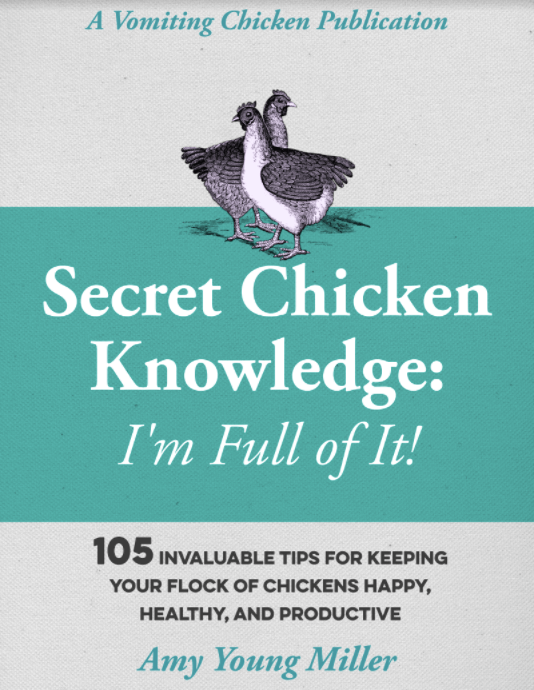 Very informative! Was everywhere as tidy as this place looked? 10 acres, shaking my head. That’s an amazing array of crops. Thank you for this post. Way! way back, about 40 years ago, husband and I were thinking seriously about emigrating to New Zealand. I wonder how life would have been different. I’ve been keeping my ear to the ground since then and haven’t heard a single reason why it wouldn’t have been a good idea. sigh. Rita, it is a beautiful and a tidy place. 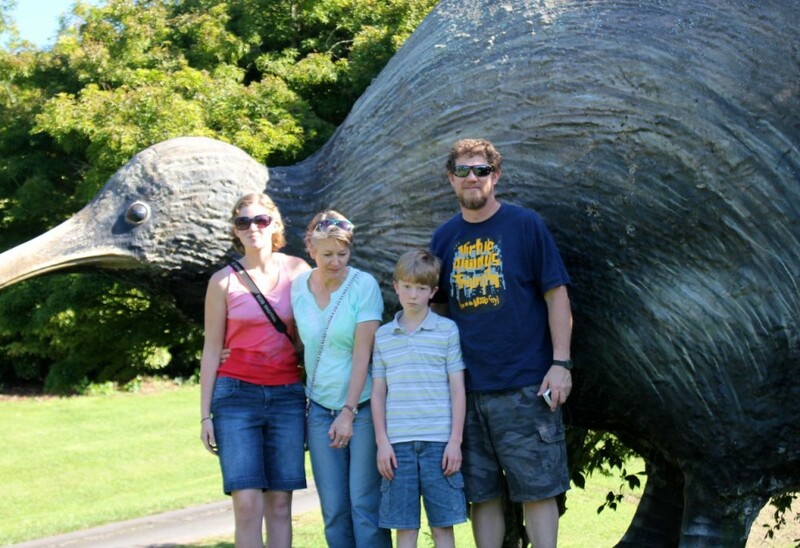 Personally the only drawback I can see about living in New Zealand is just that it is so FARRRR away from my dear ones. Also I think I would miss the wild dramatic weather from here in the Midwest (honestly)! Great article, wonderful pictures and of course a challenge. I must now attempt to grow a kiwifruit in our yard. Should not be to much of a problem because the weather sounds about like the weather in New Zealand. We have been enjoying them for years at the house and of course I used them for color on fruit platters when I was working. Most people think that they must be peeled but that is not always the case. Anyway, now I must start looking around and see if there are kiwifruit plants available or if I start from seed. Yes, Chef, you must grow some! Keep me posted on your progress! Great lesson! Beautiful fruit trees! Lynda, I’m afraid I didn’t make myself clear on that point. They sock all the kiwifruit away in cold storage, and then pull it out bit by bit and ship it, until it all runs out, 8 to 10 months later. Then folks have to eat kiwifruit from Mexico or Italy, until the new NZ crop is ready to pick again.